CoachDeck partner UNICEF is reaching out for your help. Hundreds of thousands of children worldwide face the threat of starvation and disease every day. You can make a difference through CoachDeck’s UNICEF website portal. Knowing you’ve made a difference will make you feel great about your contribution. 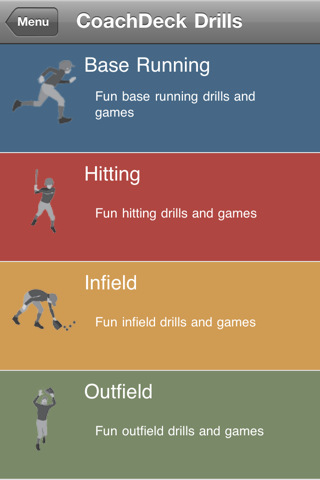 iPhone apps for CoachDeck Softball and Football coming soon! Development is underway for two new CoachDeck iPhone apps…CoachDeck for Football and Softball. Our apps for basketball, soccer and baseball are extremely popular and we expect to have the full product line up on the iTunes store within a matter of weeks. Stay tuned! If you didn’t receive the March OnDeck Newsletter today, the soccer and baseball/softball issues can be can viewed online. This month we feature great articles from Dan Gazaway, Adrian Parrish and John Ellsworth, along with several great offers for your organization and players. The March issues of our popular OnDeck Newsletter for soccer and baseball/softball will go out tomorrow, March 27. We’ve got some great articles and offers you’ll want to see. If you’re not already receiving OnDeck you can subscribe and read previous issues here. Over the years I’ve used this forum to wage a battle in favor of keeping Little League’s “titled” or “keeper” player system as an option for youth baseball organizations. For those not aware, the titled system is where a player, once drafted to a team, remains on that team for the duration of his Little League career. If you’re interested in reading some of what I’ve written on the topic, you can begin here. 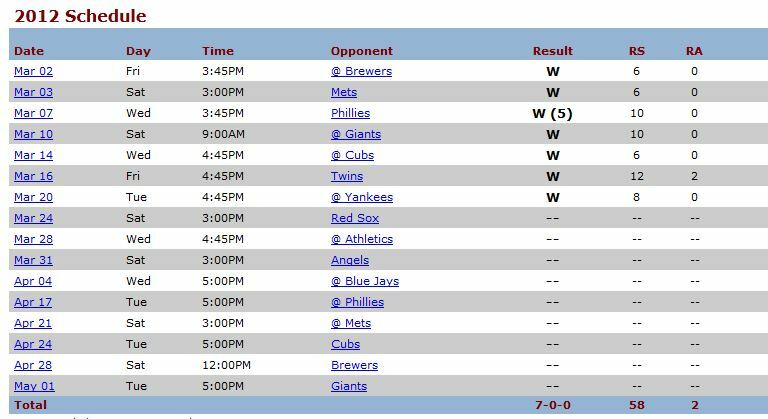 If it’s too small to read, I’ll summarize: Halfway through the season, the first place team – the Cardinals – is undefeated, 7-0, and has outscored opponents 58-2! And, because league rules do not allow teams to post margins of victory of more than ten runs, my guess is that the two 10-0 victories and the 12-2 win were probably more lopsided. This team was picked fresh this year from a common pool, designed to ensure parity. I’m not sure the Cardinals’ opponents would agree that it worked. Both teams get 10 minutes of infield warm up, starting with the visitors at 25 minutes before game time and for the home team at 15 minutes before game time. For example,for a 1:00 game, visitors take infield at 12:35 and the home team at 12:45. If the visiting team is 2 minutes late getting on the field, they get an 8 minute infield. (Here’s a tip: Practice your warm up at your weekly practice. It not only builds confidence in your players, but it will also make your pregame go smoothly). After pregame, 5 minutes before game time, managers are to line up the players on the first and third baselines and recite the Little League pledge and the Pledge of Allegiance. A player from each team can be chosen to take the lead in reciting the pledges (LL Pledge is on the back of the green book). This will take place after the umpire has had discussion with the team Managers. All players to remain in their respective dugouts during the umpire plate meeting. Only one manager and two coaches (previously approved by league) are allowed on the field during any part of a team’s pregame warm-up. Moreover, players are not permitted to circumvent this rule by going outside the field boundaries to be warmed-up by an adult. Only one manager and two coaches (previously approved by league) are permitted to interact with the players during a game. Players and coaches are not allowed to fraternize or communicate with parents, siblings or friends during the game. Our league encourages managers to teach the kids sportsmanship and show respect for opponents. Teams ahead by 10 runs or more should stop stealing on passed balls and taking more than one base on hits. Your players ought to be reminded that chanting or yelling (or doing anything designed to distract a player) is not permitted when a pitcher begins his wind up. Your team’s parents need to know this too. Umpires should be reminded that if this occurs, the umpires have discretion to call a strike on the batter or a no-pitch, whichever favors the non-offending team the most. Coaches cannot approach the umpire. Only managers can communicate with the umpire. Before addressing an umpire on a question, call time out and approach him in a calm manner. Remember, you are setting an example in your behavior. Managers are not to address players on the opposing teams. Please simply communicate to and cheer on players on your own team. No references should be made to opposing players. (i.e. “He can’t hit it…Just throw a strike”.) Please do not try to intimidate a child with comments designed to do so either directly or indirectly. The offending manager/coach will be removed from the dugout immediately. Managers and coaches must stay inside the dugout on the cement during play (no sitting on a bucket in the dirt or standing on the field. If there is a game after yours, get your team to clean out the dugout quickly and BEFORE taking them down the line to have a post-game talk. This is common courtesy as there is another team waiting to get in and get ready with precious little time to do so. Take your post-game talk outside the field so the teams for the next game can begin getting ready. Home team is responsible for game score reporting. Game scores should be posted within 24 hours by the home team manager. It is preferred that they be posted on game day. Home team is responsible for pitch count tracking and reporting. If there is a discrepancy, the home team’s record of pitch count will be used. The pitch count volunteer should be “neutral” during the game sitting outside the home team dugout and close to the umpire. To avoid any problems with pitch count reporting, managers should carry a pitch log and have it signed by the other manager at the end of the game. Home team sets up the field; visitors break it down. (Including dragging it, watering if necessary). Both teams are responsible for picking up trash in their dugouts before they leave). When dragging before new, upcoming game, please try not to drag over the chalk. All injuries or players who have quit need to be reported immediately to the Division Coordinator, Player Agent and Safety Officer within 24 hours. Managers who are playing with less than a roster of 12 (or 13 in Juniors) and have not notified all parties are subject to penalty from the league Board of Directors. Coaches may not warm up pitchers or any players at any time. Please have the player on the bench that inning ready to warm up pitcher to move game along. This should be an expectation of the player who is on the bench. Please remember that this is a game for the children not the adults. No spectators may stand behind home plate. It is up to the manager/coach to ask them to move. The umpires have discretion to remove the offending team’s manager from the game if it persists. Parents or other non-coaches may not coach from stands/behind fence. Cannot say things like, “infield – coming home on a ground ball,” “Johnny, move in,” “get closer to the plate,” etc. Parents may cheer for their team but must leave coaching to the approved volunteer coaches in the dugout. MAKE THIS A FUN EXPERIENCE FOR EVERY PLAYER ON YOUR TEAM! Pitching velocity: Three kinds of velocity? Did you know there are three types of pitching velocity? They are real, perceived and effective velocity. I am going to spend more time talking about perceived and effective pitching velocity more than I will real velocity because there is simply more to them. Real pitching velocity is what shows up on the radar gun; easy enough. That’s all there is to it. Perceived pitching velocity is truly how the hitter sees the pitch. You see, as a pitcher, we really have an advantage over any hitter, regardless of who they are. Not only is hitting a baseball one of the hardest things to do in any sport; as a pitcher you have many ways to effect the hitters inability to hit the ball. Some of these are to ensure your stride is at least as long as you are tall; you have a great delayed shoulder rotation etc. Why would that help? The closer you are to home plate at release of the baseball the better. It has been said that every foot closer you are to home plate at release; the perceived pitching velocity is 3 miles an hour faster to the hitter. Perceived, meaning, the ball appears to be traveling faster to the batter because the ball is released closer to home plate; less reaction time for hitter to react to the pitch. Would you rather have Randy Johnson throw 50 feet away from you or 45? Effective pitching velocity deals with what pitches you are going to throw, what location you will throw those pitches and in what sequence. It is very deceiving to a hitter’s eye when your arm speed and angle are the same whether you throw a fastball or a change-up. Many times hitters predict a certain pitch like a fastball and you throw a curve; or vice versa. Those scenarios explain what effective pitching velocity is.